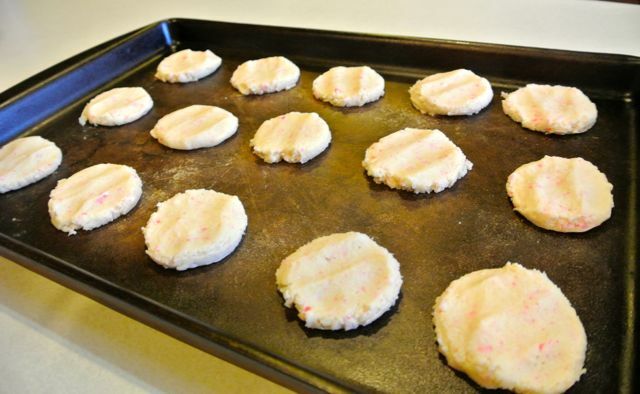 One favorite memory of childhood is candy cane cookies at Christmas. My mom made them every year. As children often do, I took it for granted, not fully appreciating how much work went in to them. That changed when I became an adult and started making them myself. The first two years were complete disasters! After those experiences, I continued to make them, I just didn’t tint half of the dough red, nor did I braid two ropes to form the cane. I simply started making them as regular, round shaped cookies that I topped with crushed candy canes after baking. 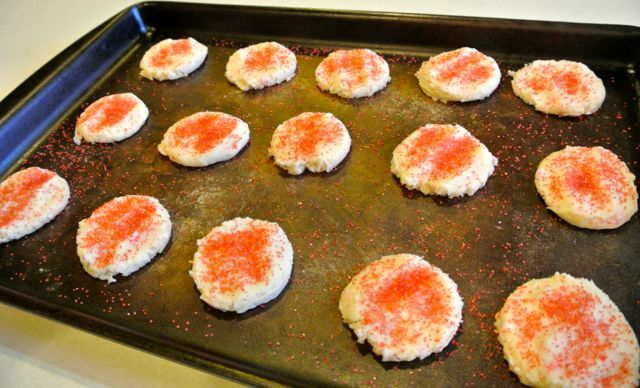 After a few years of that, I switched to topping the cookies with crushed candy canes before baking. That method was much better because the candy no longer fell off while eating. Now here we are 15 years later and I decided on an even better method – incorporating the crushed candy into the dough. This year I went healthier & used coconut oil instead of shortening & candy cane sugar from Savory Spice in place of pulverized candy canes. The results are amazing! These things melt in your mouth! *Candy cane sugar is not on Savory Spice’s website. Here is a link to their peppermint sugar, which should work just as well. Crush candy canes. I use the small ones and pulverize them in the food processor. Cream together butter, shortening, sugars, egg, & flavorings. Add salt. Mix in flour and candy. 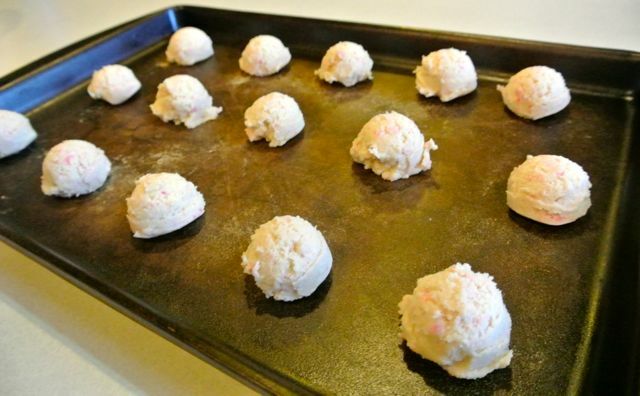 Scoop dough onto ungreased baking sheets. Flatten with your hand or a glass. Sprinkle with red sugar. Bake for 13 minutes. Allow to cool for a few minutes then remove from pan.